The 10′ Plank weighs 41 lbs. and is certified to hold 500 lbs. 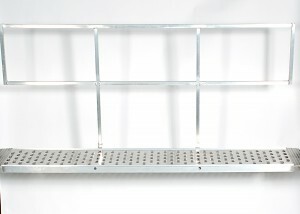 The removable full length handrail can fit either side. The Extension Planks sit virtually flush on the plank -preventing accidental tripping. One can connect the boards together to fit any need -be it a straight line, a “U” Shape, a “L” Shape, a “C” Shape, or even a “T” configuration. If you would like to order a second handrail to use 2 handrails on a plank please call us. You need 2 X-Decks to use an extension plank. PRO X-Deck 4 Step 36"
PRO X-Deck 5 Step 36"
PRO X-Deck 6 Step 36"
PRO X-Deck 3 Step 36"
PRO X-Deck 6 Step 18"
PRO X-Deck 5 Step 18"
PRO X-Deck 4 Step 18"
PRO X-Deck 3 Step 18"